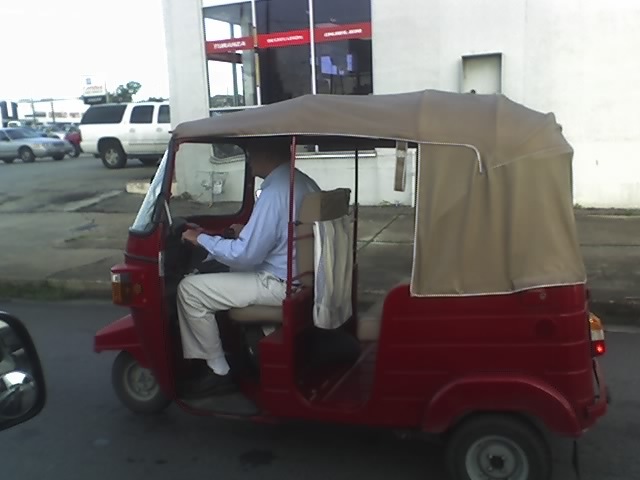 Forget EVs – get an autorickshaw – is this houston? The beloved transport superstar of Southeast Asia are hitting the streets in Houston. This dude was putting down Houston Avenue during morning rush hour. It would be nice to see these run off of clean burning CNG like all of them have been converted in Delhi. In July 1998, the Supreme Court of India ordered the Delhi government to implement CNG or LPG (Autogas) fuel for all autos and for the entire bus fleet in and around the city. Delhi observed a dramatic improvement in the quality of air with the switch to CNG, and this is important for a city where it is not uncommon to see pedestrians and drivers wearing nurse’s masks for protection against the prevalent city smog. Initially, auto-wallahs in Delhi had to wait in long queues to get their CNG cylinders re-filled, but the situation has improved drastically with the rise of filling stations that sell CNG. Certain other local governments are also pushing for four-stroke engines instead of the current two-stroke versions. Typical mileage for an Indian-made autorickshaw is around 35 kilometres per litre of petrol. That’s nuts! Was he using this for his own personal transport, rather than in a taxi-like fashion? I can’t wait to see those Tsukiji Fish Market trucks rolling on 59! I wonder what the safety rating is? 82.325104558468223423075138255258 mile per gallon isn’t as good as that prius. That’s my autorickshaw in the photo. I’ve been driving it to work for about 2 years. It has about 20,000 miles. It is a 4 stroke, and it gets around 90 mpg depending on road conditions and which way the wind is blowing. I don’t know how much a Prius gets, but I believe it is a lot less. You’d be amazed at the number of pretty women who ask for a ride. I believe the autorickshaw is pretty safe. I’ve never even had a close call. At the time of day I go to work, the autorickshaw is as fast as any thing else. I intend to buy another for my 78 year old mother soon. This seems like a long shot but I’ll still try – any chance one can rent your rickshaw Mike? I have no doubt they are safe, there are millions of people using them on the other side of the world everyday to travel safely. I’ve seen you and someone else cruising around town in it. Is there more than one? How can I buy one with the proper emission standards for Texas and how much? Email me back where we can get into more details. It brings back good memories. I liked the thing where pretty women ask you for a ride. If at all I go for this, it would only be for this one reason. Michael, I would like to know where to get one in Houston. I want to get one in NJ. Can you help with the registration process and where did you get your’s from? ← Who killed the Electric Car?